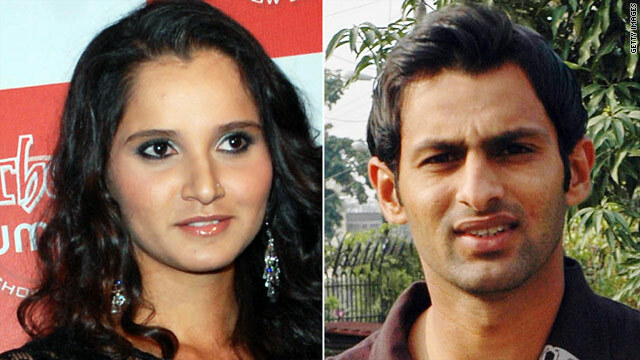 Sania Mirza and Shoaib Malik will be married in April and plan to live together in Dubai. (CNN) -- Indian tennis player Sania Mirza has used her Twitter page to thank well-wishers following the announcement of her marriage to Pakistan cricketer Shoaib Malik. The wedding, which will take place in April, brings together two nuclear powers historically divided by political and sporting rivalry. "Hi Guys! Me & Shoaib are very happy in this new phase of our life.Want to thank the media & all you guys for the wishes. Lots of love to all." Mirza divides opinion in India, drawing criticism from strict Muslim groups for her short tennis skirts and jewellery, while gaining plaudits and fans for her achievements on the court. She became the first Indian to win a WTA Tour title in 2005, reached the fourth round of the U.S. Open later that year and won the Australian Open mixed doubles last year. The announcement of the marriage between the two Muslims comes two months after Mirza broke off her engagement to a childhood friend. "I have been in the constant glare for too long and would appreciate the privacy at this very personal moment in my life," her statement said. Malik, 28, is a former national captain who is currently serving a year-long ban from the Pakistan Cricket Board due to indiscipline on a tour of Australia. He caused controversy in 2007 when, after losing to India in the World Twenty20 final, he thanked Muslims from "all over the world" for their support.